Time travel is a mysterious and intimidating beast. Modern fiction writers and directors have spent decades grappling with the ‘rules’ and ‘boundaries’ of this perplexing subject. Everyone from Back to the Future’s Marty McFly to Looper’s Joseph Gordon-Levitt/Bruce Willis hybrid has fallen through time travel’s endless loops. Indeed, the latter discouraged its mechanics within the movie. What does Hollywood do next, then? How about mix one plot device people love with another? Perfect, now sit back and watch the profits roll in! Project Almanac, despite being Hollywood’s first time travel/found footage project, is the middling bi-product of a cynically produced experiment designed to zap you hard-earned dollars into another dimension AKA the studio’s ungodly pile of cash. With Paranormal Activity, Cloverfield, and The Blair Witch Project having depleted the proverbial hand-held battery, Project Alamanac is running on unfulfilling concepts and derivative set pieces. Sadly, this sci-fi/found footage entry, changing names more often than Prince (Cinema One, Welcome to Yesterday etc. ), was delayed one year only to be, like the movie’s aforementioned “temporal location device”, dusted off and lapped up by horny adolescents. Our characters, bafflingly, cover only a small number of Project Almanac’s clichés. Our archetypes, taken directly from Stand By Me and Superbad, are inexplicably thinner and less consistent than the plot. The stitched-together-by-some-guy-in-a-booth-somewhere footage follows aspirational, and virginal, whiz-kid David Raskin (Jonny Weston). Wholly similar to Andrew Garfield’s twitchy Peter Parker/Spider-Man kerfuffle, our lead stutters through our twisty-turny narrative. David, convinced his latest invention will hurl him straight into MIT, is one of his school’s best and brightest. In fact, his similarly geeky friends, Adam (Allen Evangelista) and Quinn (Sam Lerner), worship at his feet. Of course, the friend characters are defined by overused and obvious character traits. Calling them “Horny One” and “Asian dude” would have saved its screenwriters even more time. Our three leads and the camera ogle the lead female character, David’s long-time crush (Sofia Black D’Elia), mercilessly. Worse still, David’s sister Christina (Virginia Gardner) serves primarily as Camera 1. The narrative, resting heavily on its mind-numbing time travel logistics, is simultaneously convoluted and simplistic. Our science-obsessed crew’s mission divides the plot-hole chasing critics and easily-entertained crowd members swiftly. Our crew – established as ridiculously intelligent in David’s basement but underwhelming in the classroom – flip between fulfilling and childish on the fly. Despite the over-the-top scientific jargon, it never successfully explains how the machine works. Instead, we’re to be bowled over by a reality in which X-Box, smartphone, car battery, and modem components can come together to send us back in time. Despite said obvious logistical flaws, the crew gives itself the opportunity to travel back three weeks to fix certain issues. Their plans, however, are only as complex as the screenwriters’ talents. They, after winning the lottery and solving key high-school problems, they make the ultimate decision to…catch a music festival featuring Imagine Dragons. Really?! 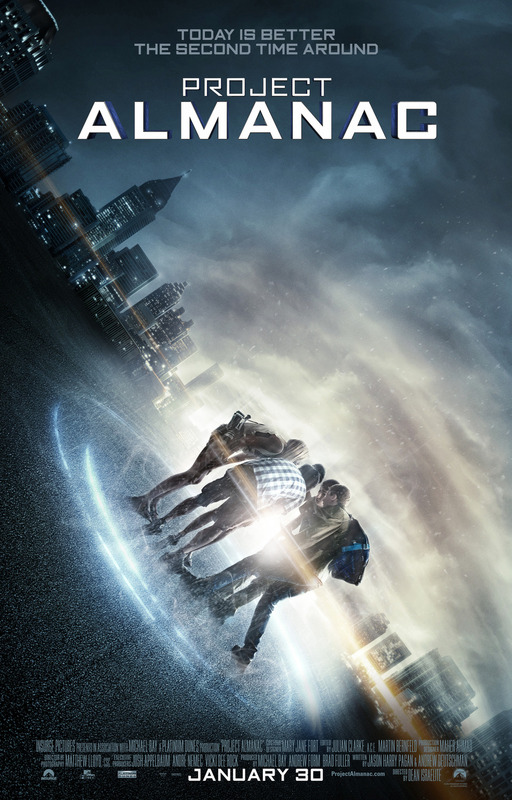 Once again, like several recent found footage flicks, Project Almanac has no reason to be presented like this. Some mystery-thriller aspects – e.g. outlining this footage as police or military property, highlighting the contrast between present day and the footage’s date etc. – could have developed some sense of tension or impact. Instead, the quaky-cam effect does nothing but rumble the shaky-cam-sick-people’s stomachs and prevent producers/studio heads from spending too much. Sadly, Project Almanac is yet another push for MTV and Michael Bay’s Platinum Dunes to keep horny teenagers stimulated. If it is any consolation, the trailer and final product match up perfectly for their intended audience. Product placement for X-Box 360 and Red Bull, despite the obvious wave-in-front-of-the-camera antics, illustrated the best and worst parts. Project Almanac, despite its nightmarish distribution schedule and transparent commercial allure, could have been 2015’s biggest surprise. It, delivering several fun moments and funny wisecracks, seemed on track to complete the jump from conventional teen flick to enjoyable romp. However, each fault causes an unending ripple effect up until the cute finale. Coffee you Say, Step this Way! you are not understanding anything entirely, but this paragraph offers good understanding even. feeds, so when I have time I will be back to read a great deal more, Please do keep up the great jo. Your website provided us with helpful info to work on. You have performed an impressive task and our whole community will probably be grateful to you.